Most oral cancers are a type called squamous cell carcinoma. These cancers tend to spread quickly. Smoking and other tobacco use are linked to most cases of oral cancer. Heavy alcohol use also increases the risk for oral cancer. 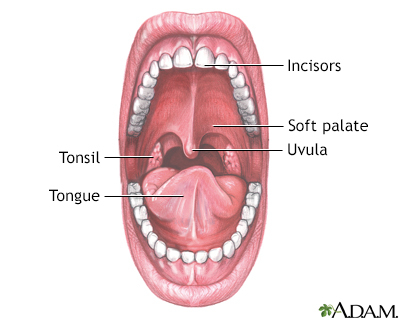 Some oral cancers begin as a white plaque (leukoplakia) or as a mouth ulcer. Men develop oral cancer twice as often as women do. It is more common in men older than 40. A biopsy of the sore or ulcer will be done. This tissue will also be tested for HPV. CT, MRI and PET scans may be done to determine if the cancer has spread. Surgery to remove the tumor is recommended if the tumor is small enough. If the tumor has spread to more tissue or nearby lymph nodes, a larger surgery is done. The amount of tissue and the number of lymph nodes that are removed depend on how far the cancer has spread. Surgery may be used together with radiation therapy and chemotherapy for larger tumors. About one half of people with oral cancer will live more than 5 years after they are diagnosed and treated. If the cancer is found early, before it has spread to other tissues, the cure rate is nearly 90%. More than half of oral cancers have spread when the cancer is detected. Most have spread to the throat or neck. It is possible, but not fully proven, that cancers that test positive for HPV may have a better outlook. Also, patients who smoked for less than 10 years may do better. Patients who require larger doses of radiation along with chemotherapy are more likely to have more severe problems with swallowing. Oral cancers can recur if tobacco or alcohol use is not stopped. Oral cancer may be discovered when the dentist does a routine cleaning and examination. Call your provider if you have a sore in your mouth or lip or a lump in the neck that does not go away within 1 month. Early diagnosis and treatment of oral cancer greatly increases the chance of survival. HPV vaccines recommended for children and young adults target HPV sub-types most likely to cause oral cancers. They have been shown to prevent most oral HPV infections. It is not clear yet whether they also are able to prevent oral cancers. Little JW, Miller CS, Rhodus NL. Cancer and oral care of patients with cancer. In: Little JW, Miller CS, Rhodus NL, eds. Little and Falace's Dental Management of the Medically Compromised Patient. 9th ed. St Louis, MO: Elsevier; 2018:chap 26. National Cancer Institute website. 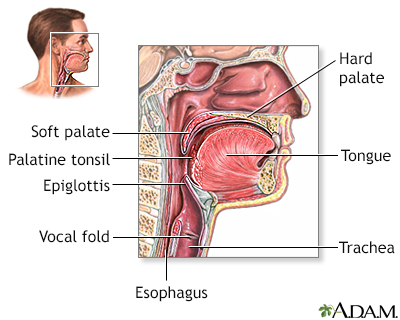 Oropharyngeal cancer treatment (adult) (PDQ) - health professional version. www.cancer.gov/types/head-and-neck/hp/adult/oropharyngeal-treatment-pdq#link/_528. Updated: March 28, 2018. Accessed July 27, 2018. Wein RO, Weber RS. Malignant neoplasms of the oral cavity. In: Flint PW, Haughey BH, Lund V, et al, eds. Cummings Otolaryngology: Head and Neck Surgery. 6th ed. Philadelphia, PA: Elsevier Saunders; 2015:chap 93. Reviewed By: Josef Shargorodsky, MD, MPH, Johns Hopkins University School of Medicine, Baltimore, MD. Also reviewed by David Zieve, MD, MHA, Medical Director, Brenda Conaway, Editorial Director, and the A.D.A.M. Editorial team. Editorial updates 07/27/2018 and 10/01/2018.